Self contained studio with tea/coffee facilities,Microwave, Queen Bed, Quite & peaceful. Great economical option. Comfortable units catering for up to 5 guests. Queen plus 3 singles. Basic cooking facilities. Tranquil garden surroundings. Great place to relax and unwind. Continental breakfasts avail. Comfortable and spacious units ideal for families. Queen plus 4 single beds. Basic cooking facilities. Tranquil garden surroundings. Great place to relax and unwind. Continental breakfasts avail. 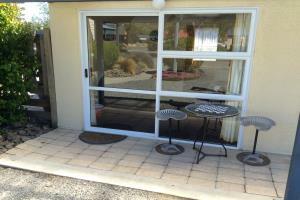 Warm comfortable units with 3 single beds, Heating. Linen supplied. 3 single beds with linen, TV, DVD player,Heater,Couch,Table,Shared facilities with toilet & shower opposite.